This Classic Beef Wellington recipe is the best I've ever followed. Which is why I'm sharing it exactly as written from Fine Cooking. We recommend not taking any shortcuts, and you'll absolutely love the results. A true show-stopper of a dish. Position a rack in the center of the oven, and heat the oven to 325 F. Butter two 8-oz. ramekins. Inspect the chicken livers and trim and discard any green-yellow patches. Cut each liver in half. Put the shallots, garlic, thyme, Madeira, and brandy in a small pot and bring to a boil over medium heat. Simmer, checking frequently, until reduced to about 1 tbsp of liquid, 2 to 3 minutes. Strain and reserve liquid. Put the chicken livers in a food processor. Add eggs, the reserved liquid, 1/2 tsp salt, and 1/4 tsp pepper. Process until smooth, about 30 seconds, gradually pouring in the melted butter while the motor is running. Strain the mixture into the ramekins. Put the ramekins in a 9x13-inch baking dish and pour in enough hot water to come about 1 inch up the sides of the ramekins. Bake until puffed, golden brown, and set, about 30 to 35 minutes. Remove the ramekins from the roasting pan and let cool completely, if not using immediately, cover tightly with place wrap once it is cool. You will use one of the ramekins for the beef Wellington. Enjoy the other with crackers. Heat the butter and oil in a 10-inch skillet over low heat. Add the shallots, and cook, stirring often, until translucent, 3 to 4 minutes. Add the mushrooms, stir well, and raise the heat to medium. Cook, stirring occasionally until the mushrooms have cooked down to a thick, almost black mixture, about 15 minutes. Season with a pinch of salt and a few grinds of pepper. Stir in the parsley, then transfer to a small bowl and let cool completely. (The duxelles can be refrigerated for up to 2 days or frozen for up to 2 months). Bring 6 cups of the beef stock to a boil in a 12-inch skillet over medium-high heat and boil until reduced to 2 cups, 20 to 25 minutes. Add the Madeira and continue boiling until the liquid is again reduced to 2 cups, about 5 minutes. In a large bowl, whisk together the flour and salt. Make a well in the center, break in the eggs, and add 1/4 cup of the milk. Melt the butter in a 10-inch skillet over medium-low heat. Swirl the pan to coat with the butter; pour the excess butter out into a small bowl. Whisk 1 tbsp. of the melted butter into the batter. Reserve the rest for greasing the pan between crêpes. Increase the heat to medium-high and pour 1/4 cup of the batter into the skillet. Swirl so the batter thinly and evenly coats the base of the pan. Cook until the crêpe is spotted with brown on the underside, about 1 minute, then flip and cook the other side until lightly browned, 30 seconds to 1 minute more. Repeat with the remaining batter, greasing the pan off the heat as necessary. Remove the beef from the refrigerator about an hour ahead so it has time to lose its chill. Pat the beef dry and season all over with salt and pepper. Heat the oil in a 12-inch skillet over high heat until very hot. Sear the beef until it is evenly browned all over (don't worry about the ends), 2 to 3 minutes per side. Transfer the beef to a baking sheet and let cool. In a medium bowl, mash the pâtè and the duxelles with a fork until they form a soft paste. Lay 4 crêpes on a clean work surface, overlapping them just enough to give you a 13x13-inch roughly square surface. Dot the pâtè mixture over the crêpes, then use an offset spatula, or a knife, to spread it evenly across the crêpes' surface. Fuse the two puff pastry sheets together by slightly overlapping them and lightly rolling over the seam until adhered. On a lightly floured surface, roll out the puff pastry to a 13x16-inch rectangle. Transfer the wrapped beef to the center of the pastry and tuck any crêpes that have come loose back into place. Bring the pastry up around the beef, smoothing out any air pockets. Brush some of the beaten egg along the bottom edge of the seam and then press gently to seal; trim off any excess puff pastry. Seal the pastry similarly at the ends. At least 20 minutes before baking, position a rack in the center of the oven and heat the oven to 425 F.
Brush the Wellington with the remaining beaten egg. Using a sharp knife, score the surface of the pastry with 3 diagonal lines: IMPORTANT: Be careful not to cut all the way through the pastry. Put the Wellington in the oven and immediately reduce the temperature to 425 F. Roast for 10 minutes, then reduce the heat to 400 F and roast until an instant-read thermometer inserted into the center of the Wellington registers 135 F for medium-rare, 20 to 25 minutes. Transfer to a carving board and let the Wellington rest for 10 minutes. 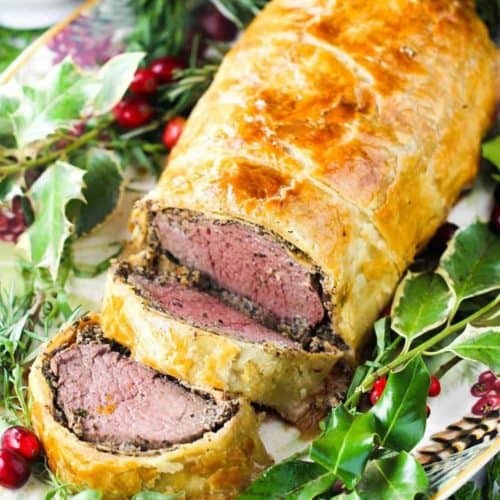 (The Wellington can rest up to 3 hours before cutting). Meanwhile, finish the sauce by heating it in a 12-inch skillet over medium heat. When it begins to simmer, reduce the heat to low and whisk in the butter, a few pieces at a time. Do not allow it to boil. Season to taste with salt and pepper.